How to issue the Chinese tax invoices for Chinese clients after the China WFOE set up? How many types of tax invoices currently exist? How to apply for Chinese tax invoices? How to invoice correctly? How to keep the invoice in a proper way? How to obtain an official tax invoice in China? China official tax invoices (Fapiao), as an important means for tax authorities to “manage and supervise tax by methods of China official invoices”, are the receipt and payment vouchers during business operations, as well as the original vouchers for business activities, and are the main vouchers for the production and business accounting for enterprises and individuals. Chinese invoice has three pages at least. Invoice page is the accounting voucher for the purchaser to calculate the purchase cost and VAT input tax, the deduction page is provided to the buyer to submit to the tax authorities for certification and retention on the voucher, bookkeeping page is used as the sales party accounting sales revenue and VAT sales tax accounting vouchers. Receipts or vouchers are issued at the time of receipt and payment of non-business activities. 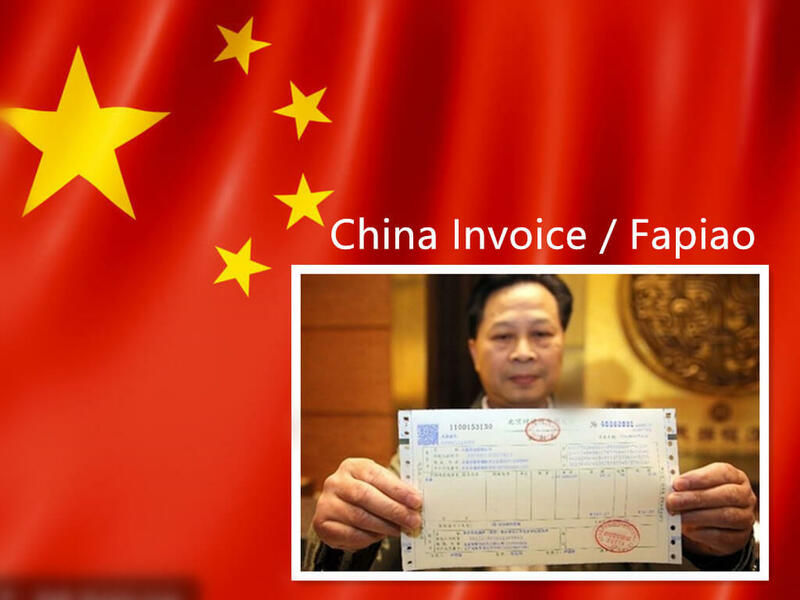 They are proofs of the receipt of current payments, but they cannot function as the Chinese invoices (Fapiao) to be tax vouchers or legal vouchers. The basic contents of the invoice include: invoice name, invoice code and number, serial number and usage, customer name, bank and account number, product name or business item, unit of measure, quantity, unit price, amount inscribed, biller, and billing date, billing unit (individual) name (chapter) and etc. Second, how many types of tax invoices currently exist? There are mainly four categories of China invoices, i.e. VAT ordinary invoices, VAT special invoices, electronic VAT invoices and ordinary invoices (Hint: For other provinces and municipalities invoice types, please consult local 12366). Third, how to apply for Chinese tax invoices? According to Article 15 of the "Procedures for Invoice Management of the People's Republic of China", enterprises and individuals who need to apply for invoices shall bring business license and the ID or passport original of the applicant, plus with invoice special chapter stamps to the tax authorities. If all the documents are complete and meet the requirements, the blank invoice will be issued on the spot. If you apply for a special VAT invoice, you must register in advance as a VAT general taxpayer (excluding small-scale taxpayers from the lodging industry to issue invoices), and apply a maximum billing limit approval, a tax control card, or a gold tax disk. Fourth, how to invoice correctly in China? When issuing invoices, the enterprises and individuals shall, in accordance with the prescribed time limit and sequence and stamped special seals. Enterprises and individuals shall, when selling commodities or providing labor services and services, issue invoices to the payer on their own initiative. They may not refuse to issue invoices for any reason or excuses, and may not issue receipts and other vouchers for any reason or pretext. The issuing of invoices that do not comply with the regulations shall not be used as evidence of financial reimbursement, and any enterprises or individual has the right to refuse to accept them. If the purchaser requests the seller to issue a special value-added tax invoice, it must provide the purchaser's name (not a natural person), taxpayer identification number, address telephone number, account opening bank, and account number, but it does not need to provide the business license and other relevant documents or other certification materials. When an individual consumer asks for an ordinary VAT invoice, he or she is not required to provide the taxpayer with the taxpayer identification number, address telephone number, account opening bank and account number information, and does not need to provide relevant certificates or other certification materials. No entity or individual may have the following acts of virtual invoicing: (1) Invoices for others and for themselves are inconsistent with the actual business operations; (2) Others are required to issue invoices inconsistent with their actual operations; (c) Introduce other people to issue invoices that are inconsistent with actual business operations. Fifth, how to keep the invoice in proper way? Enterprises and individuals that purchase tax invoices from the tax authorities should deposit and keep the invoices in accordance with the regulations of the tax authorities and must establish a strict custody system to properly preserve the invoices and must not arbitrarily destroy the invoices. The invoice stubs and invoices that have been issued must be kept for five years. The expiration of the preservation period should be reported to the tax authorities for inspection and destruction. If the loss or theft of an invoice occurs during the process of keeping the invoice, the enterprise shall report to the tax authority in writing on the date of the loss, and declare it as invalid. At the same time, the tax authorities shall accept the case in accordance with law. Sixth, how to obtain an official tax invoice in China? Enterprises and individuals that sell goods, provide services, and engage in other business activities shall receive payment from the buying parties. The payee shall issue an invoice to the payer. When consumers purchase goods or receive services, they should take the initiative to request invoices while making payments. For invoices that do not meet the requirements, they have the right to reject or report to the tax authorities. When asking the seller to issue an invoice, he must not ask for a change in the name and amount or fill in the invoice for himself. No entity or individual may introduce other people to transfer invoices. The false invoices cannot be issued, transferred, stored, carried, mailed, or transported. If you have gone through tax registration according to law and have fixed office address, plus with a sound financial and invoice management system, you can apply to the tax authority to print the ordinary invoice printed with your company’s name. VAT special invoices shall be subject to the administrative licensing management of the maximum billing limit, that is, the total amount of the invoices issued for a single special invoice shall not exceed the upper limit, and the maximum billing limit shall be applied by the general taxpayer according to law. Ninth, how to check the authenticity of invoices? The tax authorities provide the following channels to verify the authenticity of the invoices: (1) You can call the province's 12366 tax service consultation telephone; (2) You can log on to the National VAT Invoice Inspection Platform (https://inv-veri.chinatax.gov.cn) to conduct electronic invoice information consistency query; (3) You can carry the original invoice to the tax authorities for authenticity identification. If an enterprise or individual violates the relevant provisions of the "Procedures for the Administration of Invoices of the People's Republic of China", it shall be punished according to legal procedures; if it constitutes a crime, it shall be transferred to the judicial organ for criminal responsibility.